Bruce T. Martin is an American fine art photographer who uses photography to document the world, explore perceptions, and question our viewpoints. This exhibition of contemplative photographs provides a healing respite from the cares of contemporary life. Working photographers, from diverse backgrounds and geographical locations, create images of nature, culture and spirituality. In Jim Vecchi’s “Witness to Infinity,” we experience the vastness and timelessness of the sea. Nature is connected to spirituality in Hiroshi Watanabe’s view of a temple through snow-laden branches, while Eleanor Brown’s explorations in the Arctic return us to our primordial origins. Kent Krugh presents “Angel Oak,” a much revered 1400-year-old tree, and Bruce T. Martin’s cave connects us to the ancient Maya culture. The lyrical “Bittersweet Curl” by Anne Rowland, reminds us of a simpler, more bucolic era. The goal of The Methodist Experience is to provide an exceptional culture of personalized service, satisfaction, and engagement for all involved in the healing process. 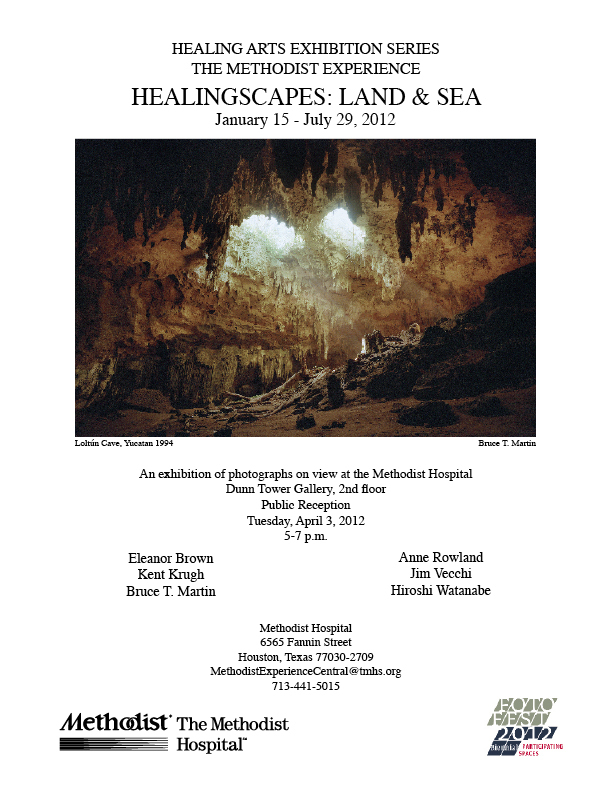 The Healing Arts Exhibition Series promotes health and healing through the beauty, harmony and eloquence of the arts, and enriches the lives of all those who experience its programs. This entry was posted in Fine Art, Maya, Uncategorized by Bruce T. Martin. Bookmark the permalink.